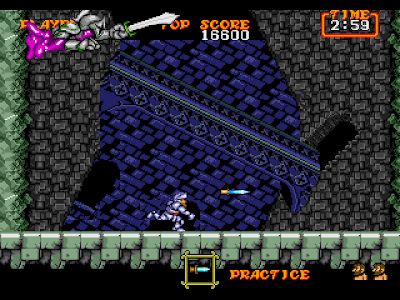 The Ghouls 'n Ghosts games are widely known as being extremely difficult. I know I always felt this way as well before really spending time with the Sega Genesis Ghouls 'n Ghosts. In doing so, I discovered some neat little things about the game. I also discovered that it's really not as difficult as I had originally thought! A while back, I took a Sega Genesis to work and kept it locked away in the breakroom. I would spend my breaks and lunches playing games that I picked up at pawn shops. One of the games I had there was Ghouls 'n Ghosts. I knew it was a difficult game, but I figured if I plugged away at it over time it would become easier. 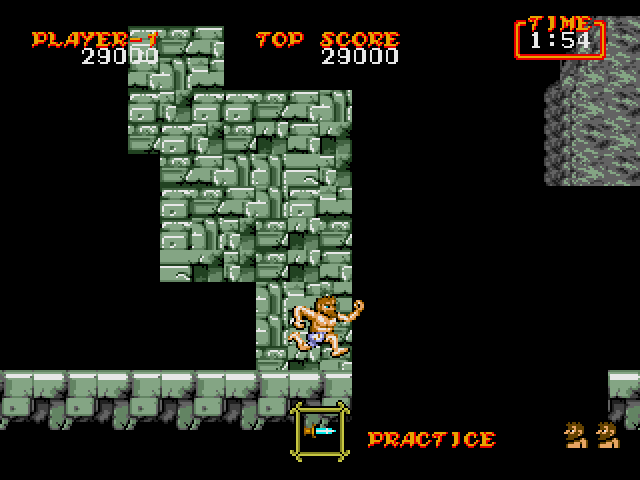 In the beginning, I could not make it past the first level, but eventually I could do it easily and then I would get stuck on the second level. This went on through the whole game. Finish one level, not be able to get past the next. Eventually I was speedrunning the game, Monday through Friday, three times a day. I was obsessed with it. Here are a few of the neat things I discovered in my time with the game. It's a little difficult to notice, but Arthur moves slightly faster when he's jumping. This can be proven by the guillotines on the first level. Simply running through them will get you hit, but if you jump continuously between them, you'll make it through okay. Another speedrun tip is don't go for treasure chests. They look appealing, but they'll slow you down trying to open them. Collecting the gold armor will also slow you down unless you're on the auto scrolling third stage. Finally, daggers! Daggers are easily the best weapon in the game. I don't want to hear otherwise. The worst weapon is the torch. The axe is pretty worthless, too. And don't get me started on the sword. Always grab daggers if you can, and avoid every other weapon you see. That sounds about right. 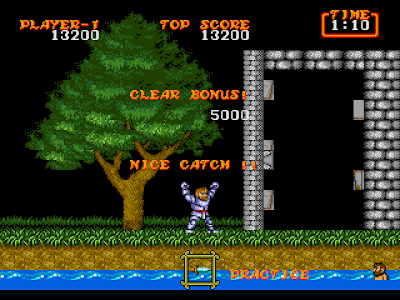 If you hold up on the directional pad when collecting the key at the end of the level, the message "Nice Catch!!" will display under your score. This took me forever to figure out. I happened to see the message once and then agonized over how to trigger it every time. You don't have to be standing where the key lands in order for the message to pop. Just holding up while you collect it is enough. After defeating the Red Arremer midway through the second stage, continue to the right until the screen starts rumbling. There is an invisible line that Arthur crosses that makes a pillar rise from the ground behind him. The moment this pillar is triggered, turn around and run towards it. If you were fast enough, you can jump on top of it. Falling off the pillar to the left will make it so you cannot escape. The only way out of this is to let the timer run out. The third stage contains a glitch that I am not 100% certain how to replicate, but I am going to mention it anyway. 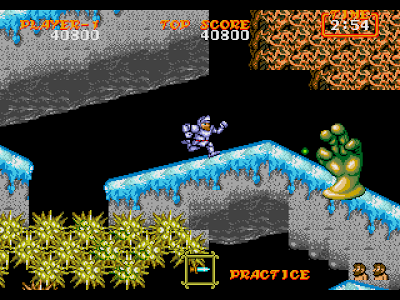 The third stage is an auto scrolling stage. 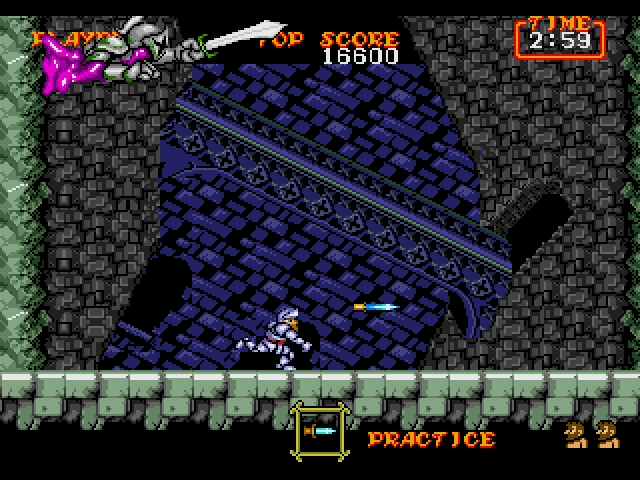 Right before the midpoint of the level (before the tongue part) there is a section of the wall you can sometimes run through. 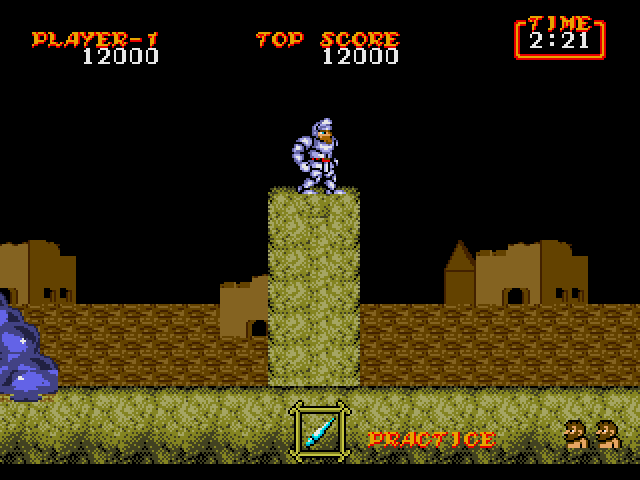 If you make it through the wall, you can ride the floor up a bit and then jump into the blackness. 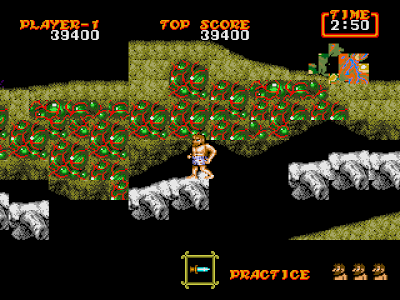 You will land on the tongue, which you can then use to run across and then jump through the stone faces, landing on a platform that comes out of the right side. I cannot get this glitch to happen every time I get to this part of the stage. I think it has to do with the speed in which you make it there. 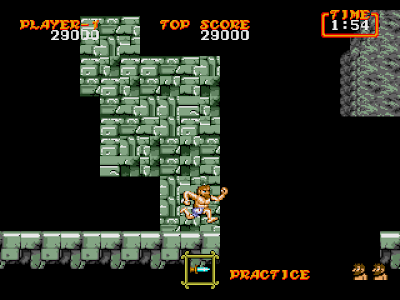 If you jump continuously between the destructible wall and this part, it puts you at this wall sooner than the game anticipates. 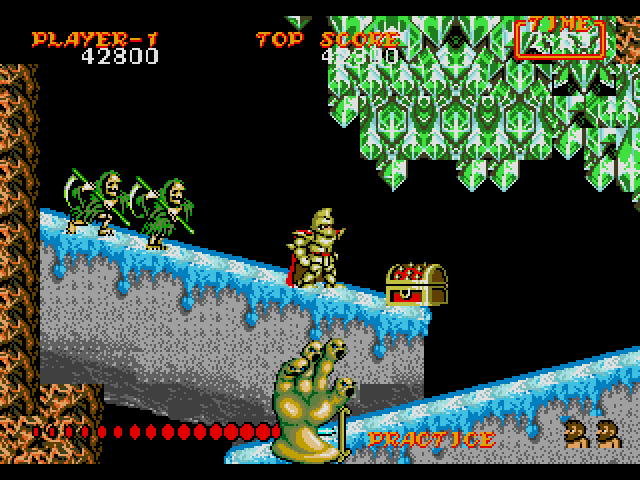 It might also have to do with which treasure chest you trigger in the beginning of the level and whether or not you grab the gold armor. I wish I had more answers for this. Anyone knows more, let me know in the comments! The fourth stage holds several interesting things. First, there's a point in the level where the palette changes over. Take a look at the screenshot below. In this shot, I have two little reaper guys following me. These guys won't always follow you, so this trick is hit or miss sometimes. The instant you fall off of the ledge to Arthur's right, the palette changes. It's tricky to do, but it's possible to jump off of the ledge, trigger the palette change, and then get knocked back onto the ledge because you hit the ceiling crystals. Try to jump into the crystal I have circled below in purple. If you were successful, you will be knocked back onto the ledge. 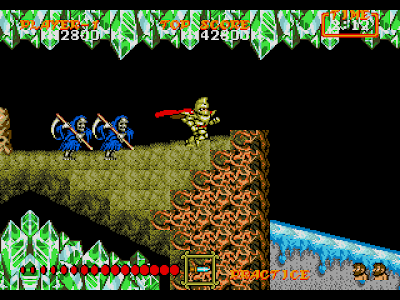 The screen will scroll differently, enemies are glitched when they begin spawning (but they'll be green when they appear), and falling off of the ledge will send Arthur falling down, down, down into the abyss. You have to get hit, but doing so will allow you to quickly bypass most of the second half of the level! Position yourself like in the picture below, then wait for the hand enemy to spit a projectile at you. If you were positioned correctly, the hit will send you flying backwards into the barb filled gap. However, you will be temporarily invincible and the barbs won't kill you! Once you land, quickly run to the right and fall through those barbs as well. You'll land near the bottom of the slippery area. If you're lucky, the chest that spawns to the left of where you land might have another suit of armor in it. There's an invisible line somewhere on the main path that activates the boss. Failing to trip that line results in the boss not being there! Position yourself like in the picture below. You'll probably have to wait for the snake enemy to make its way back to you. Allow the snake to hit you. 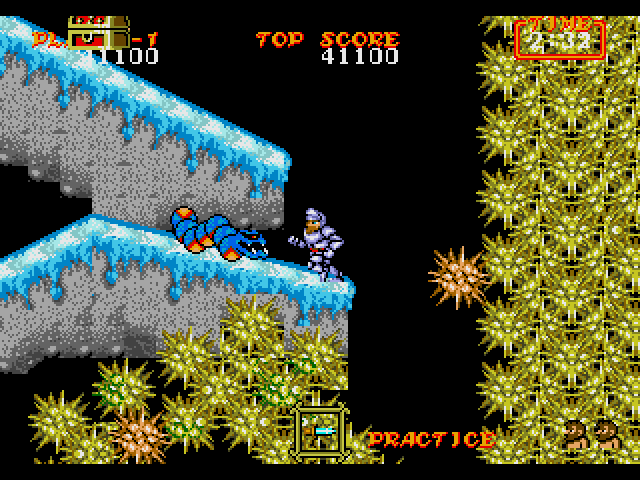 The hit will send you flying backwards into the wall of spikes, but you'll be temporarily invincible and won't be killed. Even after you stop flashing, the barbs will not injure you. 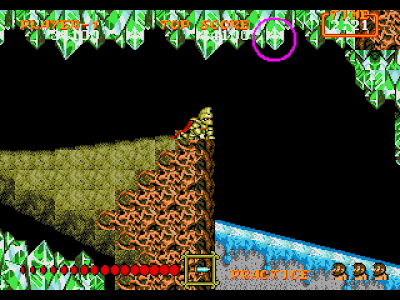 Once you fall all the way to the bottom, you'll land on a platform next to the boss. This would be a great shortcut to the boss... except the boss isn't actually there! 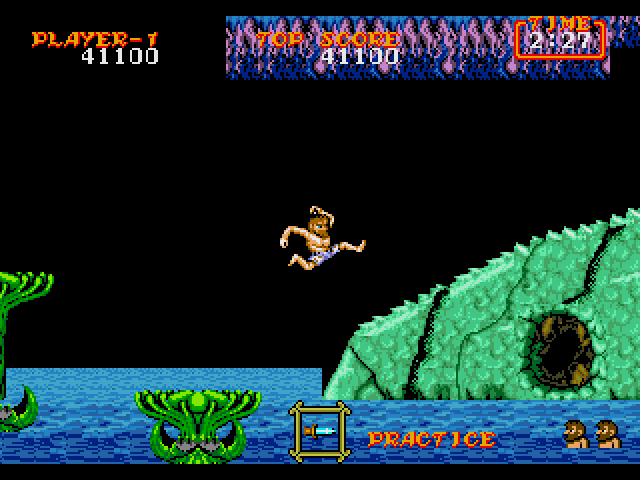 Here you can see Arthur jumping towards the boss like normal, but Arthur will actually fall through the boss and into the water, losing a life. Notice that the chambers you have to attack to defeat the boss are already blown out. Also, the top of the screen is a little glitchy. Very interesting! "Made easy" might be a little misleading, as doing this trick isn't all that easy. 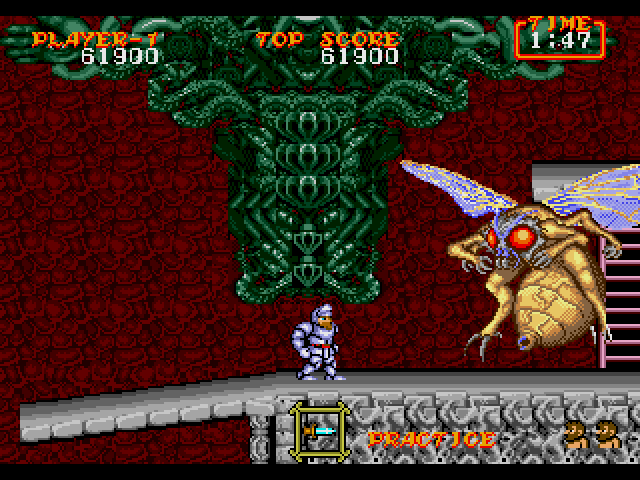 After the insect boss appears, make your way back to the left side of the screen. As his swarm of insects flies towards you, jump in the air towards the pillar. If you did it right, the hit will send you flying in the air and on top of the pillar! If you ignored the treasure chests on the way to the boss, they'll be there now. One probably has another suit of armor in it. The insect boss will not be able to go past the green wall decoration. This makes him extremely easy to kill. He can still shoot projectiles at you, but his swarm will not be able to get to you.